So I was playing Airport Madness 2 today, and I managed to beat my old high score of 260,000. In fact, I beat most of today’s high scores, which means I’ve still got it. 20 years of real-world ATC experience was not all for nothing. With each new version of Airport Madness, sales increase. But I often wonder if that’s only because my following has grown. Is AM4 really as good as AM2 was? I am trying to put my finger on what was really cool about this game in the beginning, and I plan to stick to that like glue. I’ve learned that making the planes faster does not increase fun. Keeping things slow makes it more challenging, because the decision and it’s consequence are farther apart in time. The fun in AM is predicting whether a takeoff will work. Is it a good decision to ‘line up’ a departure while still waiting for crossing traffic to land? Sometimes we dig ourselves a hole, but fail to get out later on. I’ve learned that adding pilot voice does not increase fun. Nor does radar. Nor do user profiles. These are gimicky, and will not exist in Airport Madness: Time Machine. AM1 and AM2 were cool because the airports grew. 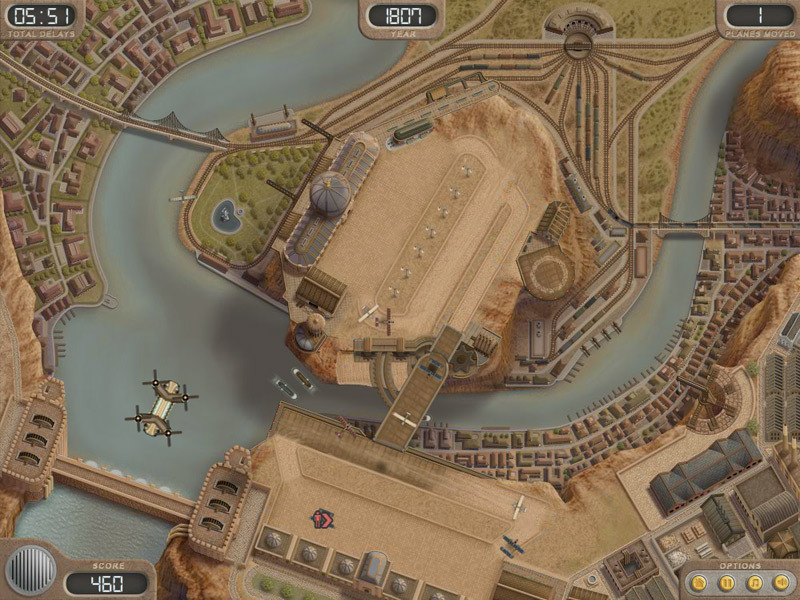 The reward for playing was the unlocking of runways over time. I truly hope that AMTM will deliver on this. It offers an airport that starts as literally nothing, and grows up to handle 747s, 50 years later. After building nearly 20 games over the years (autocorrects to tears, LOL) I’ve learned that some aspects of a game can be added immediately before release, but others must be baked in from the beginning. Like, for example, the story. A time machine? Why? Does it matter? I have a rough idea of how I will explain this to players, but there is still time to change my mind. I copied Angry birds. Well, not completely. I merely stole their concept of short, unlockable levels. In AMTM, if you pass a level, you have the option to move on, or replay the level to earn more stars. I think it’s a good fit for this game. There will be some who want everything unlocked all at once. “I want to play the FINAL level, damnit!” And there will be some who don’t want the levels to be short. Some people like to play for endurance. So I will add a ‘continuous play’ feature. The good folks at the Game Developers Conference in San Francisco think I should add a virtual currency system to the game, so that you have to open your wallets every time you want a special new aircraft or an additional runway. Statistically, there’s more money in it for me if I do. But I truly hate such games. I did this only once, in Approach Control iOS, but it fit. Each additional sector cost a buck. Your game play was not limited in any way, but additional levels were a buck. I am old-fashioned. I like the idea of offering the product with a front-end price tag. Gimme your money, and the game is yours. The levels are all locked, but that’s your job to unlock them by being the best air traffic controller you can be. This entry was posted in Airport Madness 5, Airport Madness: Time Machine, Uncategorized on March 25, 2013 by admin. While it is true that we have been busy porting some of our games to iOS lately, our priority is always Airport Madness. Our upcoming next version in the series offers an airport that grows and changes over time. This next version is named (drumroll please)…. “Airport Madness: Time Machine“. That’s right. You time travel. Without spoiling the game’s storyline, let’s just say that the game definitely has story to it. Check out this teaser video! As we test the completed parts of our game so far, watching the little grass field slowly develop into a major international airport across a lengthy time span, it feels like watching a child grow into an adult. I’ve given the game a few test plays, and it’s definitely got the “fun” factor. But it’s got something more than just fun play mechanics. It’s an experience. A really neat creation that does not simply describe aviation history to us, but shows it to us, and allows us to interact with it. “AM5” will be particularly special to aviation history buffs, although I don’t look forward to the corrective emails that I am sure to receive. “Hey, the Douglas DC3 did not enter service until 1936.”. Sure, I can’t wait until those start coming in. Although most of AMTM is based within the 20th century, the image above is from the year 2068. There are only a few key changes to the present day. Most notably: moving taxiways, airships and gyrocopters. In addition to the year 2068, there will also be the opportunity to zoom way ahead, to 2173. What will future airports look like? Our concept is basically what we feel is obvious. Airplanes will become faster and larger. Airports will become more efficient. What we will show you is an airfield where things happen fast. Planes move at ludicrous speeds, and decisions must be made quickly. Thousands of people are moved in and out of the field every minute. We will post a screenshot from the year 2173 shortly. 2173 is the real future airport we’ve mentioned before. This next Airport Madness should be a good one! This entry was posted in Airport Madness 5, Airport Madness: Time Machine on March 15, 2013 by admin.